"Oranje-blanje-bleu" redirects here. For Oranje, Blanje, Blou, see Flag of South Africa (1928–1994). The Prince's Flag (Dutch: Prinsenvlag) is a Dutch flag, first used in the Dutch Revolt during the late 16th century. The Prince's Flag is based on the Flag of Prince William of Orange-Nassau, hence the name. The colours are orange, white and blue, which is why the flag is often called oranje-blanje-bleu (or even: ranje-blanje-bleu) in Dutch. The colours orange, white and blue (Dutch: Oranje, Wit, Blauw or Oranje, Blanje, Bleu, from French Orange, Blanche, Bleu) are associated with William Prince of Orange (1533–1584). William is reported to have used these colours as early as 1577, as part of his procession entering Ghent. Jacob Duym also reports that in the siege of Leiden in 1574, the Dutch officers wore orange-white-blue brassards. From this, Rey (1837) concludes that the combination of orange-white-blue was certainly used by the Prince of Orange in the 1570s. The first reference to a naval flag in these colours dates to 1587, when the Admiralty of Zeeland ordered these flags to fly on their warships . 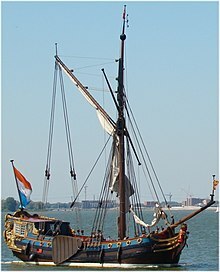 The naval flag was used by the Watergeuzen (Gueux de mer, "Sea Beggars"), the pro-Dutch privateers during the Dutch Revolt. According to de Waard (1900), the Dutch navy between 1588 and 1630 always displayed the Prince's Flag, and after 1663 always the red-white-blue Statenvlag. The latter was introduced gradually during the 1630s to 1650s, and named "States' Flag" in 1664. The orange-white-blue flag formed the basis for the South African flag of 1928. It is also the basis for the flags of New York City and Albany, New York. After the republican Patriots, aided by the French, seized control over the Netherlands in 1795, the Prince's Flag was forbidden and the red-white-blue flag became the only official flag, to the content of the French, analogous as they were to their own tricolour, chosen just a few months earlier. In the following period of the Kingdom of Holland, there was also no place for Orange and the Bonapartist King Louis I chose red. In 1813, when the French were expelled and the Netherlands regained its independence, the Prince of Orange returned to the country from England. The Prince's Flag saw a short revival; in order to demonstrate the attachment of the people to the House of Orange, both this flag and the red-white-blue flag fluttered on the roofs. In the same year, for the first time, the red-white-blue flag was flown with an orange pennant, which has remained the custom in the Netherlands. Whether the Prince's Flag or the red-white-blue flag should be the national flag was left undecided, although the Prince of Orange, later King William I, preferred the latter. In the 1930s, the supporters of the National Socialist Movement in the Netherlands (NSB) chose the orange-white-blue and the Prince's Flag as their symbol. Queen Wilhelmina in 1937 signed a Royal Decree that the colors red, white and blue are set as the official colors of the Dutch flag, partly as a signal directed at the NSB. The Prince's Flag remains in occasional, unofficial use in contexts of national sentiment. For example, it was raised from the old Matthias church tower in Warmond in 2013 as part of the celebrations of the 200th anniversary of the Kingdom of the Netherlands. 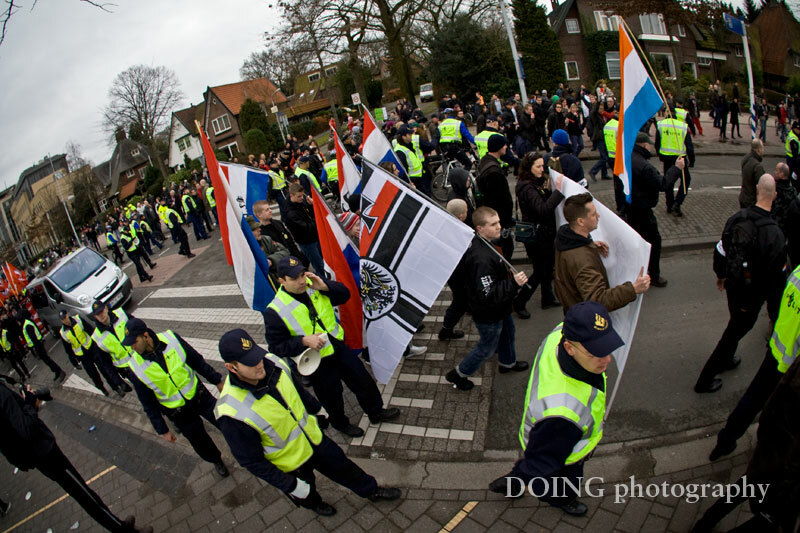 The flag is also used as a symbol of the Greater Netherlands and Dutch pan-nationalist politics. It is frequently used by right-wing parties such as the Dutch People's Union (NVU) and Voorpost, as well as the (now defunct) Nationalist People's Movement (NVB). In 2011, two members of parliament for the Party for Freedom (PVV) had the Prince's flag hanging in their offices in the parliament's building. When this was received with scrutiny, the flags were removed. Former Dutch MP Wim Kortenoeven said he regrets that the flag has some negative connotations because it has been hijacked by the NSB in war-time Netherlands. The party denounces the defunct NSB and far-right movements. At a PVV protest on 21 September 2013 in The Hague, several attendants were carrying Prince's flags. When Geert Wilders was speaking in House of Representatives the same week, Alexander Pechtold referred to the flags as 'NSB-flags', to which Wilders called Pechtold a sad, measly, hypocritical little man. In protest of Pechtold's remark, at least five members of the House of Representatives, Martin Bosma, Reinette Klever, Machiel de Graaf, Harm Beertema and Barry Madlener wore a Prince's flag lapel pin. The Prince's Flag served as the basis for the earlier flag of South Africa. This flag was adopted in 1928 and was inspired by the former Dutch flag. In the white part of the flag are the flags of (left to right) the United Kingdom, the Orange Free State and Transvaal, representing the Union of South Africa's British colonial and republican predecessor states. In 1994 the flag was replaced by the current flag of South Africa. As a consequence of its beginnings as the Dutch colony of New Netherland, several places in New York State and New Jersey use variants of the Prinsenvlag as their official flags. These places include New York City, Jersey City,  The Bronx, Albany and Nassau County (Long Island). ^ Jean Rey, Histoire du drapeau, des couleurs et des insignes de la Monarchie française vol. 2, 1837, p. 515f. ^ "Prinsenvlag is omstreden, maar kent lange historie". Volkskrant (in Dutch). Retrieved 13 August 2014. ^ "Flag Decree by Queen Wilhelmina". Flags of the World. 19 February 1937. Retrieved 2008-03-03. ^ "NVU protest walk with Prince's Flag prominently carried". Retrieved 2013-10-06. ^ Webbreezer Solutions. "voorpost.org". voorpost.org. Retrieved 2013-10-06. ^ "NVB order form listing the Prince's Flag with a lion on it". nationalistischevolksbeweging.nl. Archived from the original on 2010-09-01. ^ PVV member of parliament: Prince's Flag is a flag to be proud of, Algemeen Dagblad, May 11, 2011. ^ "Jersey City, New Jersey (U.S.)". www.crwflags.com. Retrieved 28 January 2019.